Teens who use JUUL are more likely to turn to cigarettes. JUUL Labs has been under fire from the FDA for its role in helping create the growing teen e-cigarette epidemic. And now, the Bay Area-based, $16-billion, e-cig company has taken a page from the tobacco industry playbook by funding scientific research, contracting with labs that critics say have a history of favoring the tobacco industry, and creating its own school curriculum that appears to be geared more toward burnishing the company's image than helping teens avoid vaping. Researchers at leading universities, including UC San Francisco, Johns Hopkins, and the University of Louisville School of Medicine who study e-cigarettes, say they have been receiving offers of funding and materials from JUUL labs employees. "Right now, JUUL is sort of saying, 'We're not the big tobacco industry,'" said Alan Brandt, a professor of the History of Science at Harvard and author of The Cigarette Century who has extensively studied the tobacco industry. Brandt added that in its efforts to fund scientific research, JUUL is following in big tobacco's footsteps. "In many ways, this resembles the strategies that the major tobacco industries used in the 20th century." JUUL officials say they are merely trying to clarify the benefits and risks of their products through independent research, but academic researchers say that collaborating with any tobacco company would ruin their reputations due to the legacy of research manipulation on the part of big tobacco. From the 1950s through '80s, big tobacco companies, such as R.J. Reynolds Tobacco and Philip Morris International Inc., funded research on a massive scale in order to sow doubt about the links between cigarettes and cancer, said Robert Proctor, professor of the History of Science at Stanford University. Proctor calls the approach "distraction research," because the companies invested in research that looked for non-tobacco-related causes of disease, like viruses and DNA mutations. "It also had the secondary benefit of creating allies in the scientific community who were useful as references in recommendation for litigation," Proctor added. Alex Carll, a professor of physiology at the University of Louisville who studies e-cigarettes, said that after he presented his research on the cardiac toxicity of e-cigs on mice at the annual American Heart Association conference in Chicago in November, JUUL representatives at the conference approached him and offered up to $200,000 in lab equipment for a proposed study to specifically test the effects of JUUL's vapor on the hearts of mice. "JUUL may be different than big tobacco, I don't know," said Carll. Nonetheless, he said he decided not to accept the offer. And after UCSF post-doctoral fellow Leila Mohammadi and UC Berkeley undergraduate Daniel Han presented their research on the negative health effects of e-cigarettes on cardiovascular cells in a poster session at the same conference, they were approached by three JUUL employees who offered to provide them with free JUUL products for their study, they said. "At first, I thought it was positive news," said Han. But after speaking with his supervisor, Han realized that accepting gifts from an e-cigarette company in order to study the effects of that company's e-cigs would be a conflict of interest. JUUL officials told the Express that it's common for the industry to fund academic research. Another way that JUUL is mimicking the traditional tobacco industry is by contracting with labs to conduct research that comes out in its favor, alleged Robert Jackler, a professor at Stanford University's School of Medicine who has done extensive research on JUUL's marketing. For example, JUUL paid the Glasgow-based Centre for Substance Use Research lab, which then produced a study about how flavors are important to adults who switch from smoking cigarettes to using JUUL, Jackler said. That lab, however, has a history of working with major tobacco companies, and, according to Jackler, its research always favors the tobacco industry. JUUL says its mission is to "help adult smokers switch from combustible cigarettes" to a less-harmful option; e-cigarettes without smoke or tar. Jackler said that, of course, some adult smokers will say fruity flavors are important to helping them quit but that JUUL "should have been looking at how those flavors appeal more to kids." "This is not hypothesis-driven research," said Jackler. "You can create a study to say anything you want it to say if you set the methodology clever enough." Neil McKeganey, director of Glasgow's Centre for Substance Use Research, said in an email that he could not comment on whether the findings from the lab's various studies favor the tobacco industry. But, he added, "I have not sought to obtain the view of tobacco companies about our research findings." In an email to the Express, JUUL Labs spokesperson Victoria Davis said JUUL paid the Centre for Substance Use Research to do a number of studies because the lab is staffed with experts. "It is common practice across many industries including harm reduction, pharmaceuticals and medical devices for companies that invent products or medicines to contract independent organizations to conduct studies," she wrote. JUUL also recently put out a press release about a self-funded study, claiming that aerosol from the company's cucumber, mint, and menthol flavors are not toxic to living cells when compared to traditional cigarettes. But Laura Alexander-Crotty, a practicing physician and assistant professor at UC San Diego who has studied the toxicity of e-cigarettes, said the main components of any e-cigarette — nicotine, glycerol, and glycerin — are toxic to cells, just not as toxic as combustible cigarettes. Studies like the one JUUL touted, which compare e-cigarettes with regular cigarettes, are "tricky," she said, because one puff of an e-cigarette will inevitably seem harmless when compared with one puff of a regular cigarette. The study of JUUL aerosol was conducted by Enthalpy Analytical, a supposedly independent lab. However, the lab touts itself as being "client focused" and the main doctor listed on the study is Manoj Misra, a JUUL Labs employee, according to JUUL's own press statement and Misra's LinkedIn page. JUUL recently launched an independent study research portal, where investigators can submit proposals for research funding consideration. Teens are now more likely to use e-cigs than regular cigarettes, and 30 percent of teens who use e-cigs move on to smoking regular cigarettes within six months, according to the U.S. Centers for Disease Control. But no e-cig device is as concerning as JUUL's products, not only because of JUUL's popularity among teens, but also because of the addiction potential of its e-cigs. 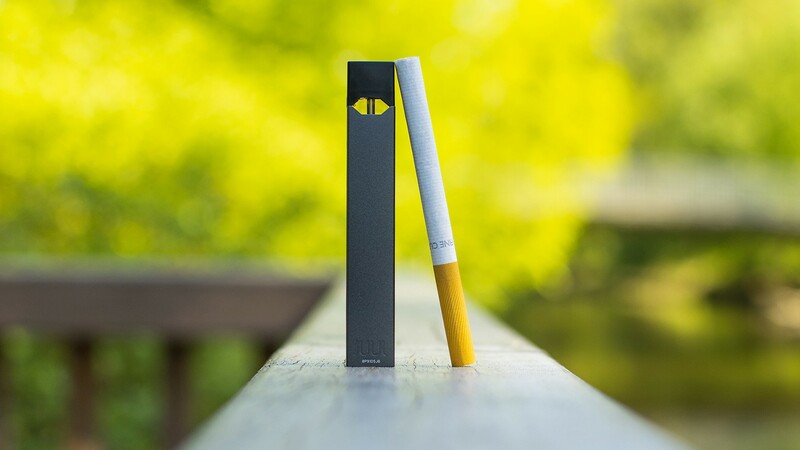 Unlike most other e-cig brands, which contain "free-base" nicotine, JUUL contains nicotine "salts," which can deliver a much heavier hit of nicotine without the throat-burn of regular cigarettes or free-base nicotine — making it much easier for kids with young lungs to inhale, and thus become addicted. In the 1980s, big tobacco also created youth smoking "prevention" programs. But after millions of tobacco industry documents were uncovered, it became clear that the purpose of these programs was to make tobacco companies look good to policy makers, stakeholders, and parents, rather than to actually help kids stop smoking. JUUL recently released its own school curriculum to educate kids about e-cigarettes, and the company is offering $10,000 to schools who choose to implement it. But researchers say the content of the JUUL curriculum shares a striking resemblance with the curriculum that big tobacco put out in the '80s and '90s. Bonnie Halpern-Felsher, a professor of pediatrics at Stanford University who designed her own research-based tobacco curriculum that is being used across the globe, said JUUL's school curriculum, like big tobacco's before it, does not mention its own products and does not explain how the marketing of tobacco products targets kids. Instead, she said, it tells kids that tobacco use is for adults — something that is known to motivate kids to smoke.